Each of the two models (Courier and Quickscreen) has two graphic/fabric options,Dye Sublimation and Ink Jet. Both types of imaging are very high-resolution and are photo-quality. The advantages of Dye Sublimation are that large areas of solid color are more consistent and all the colors are slightly more vibrant.The advantages of Ink Jet are the banner can be washed and ironed,they are less susceptible to damage (resistant to scratching,etc. ), and the material is more fabric-like (easier to roll,etc.). Courier Bandstands - Courier Bannerstands are a lightweight portable stand that sets up in under a minute.A tubular plastic base with dual support feet,and a three-piece shock corded pole supports the desired graphic in an upright position.In storage, the graphic wraps around the base. Quickscreen Bannerstands - Quickscreen Bannerstands are a portable stand that sets up in under a minute. The supporting pole,which stores into the metal base of the unit,attaches into the base in an upright position.Once setup, the banner pulls out from inside the base,and attaches to the top of the pole. The base unit is available in silver or black. Carry case included. Eclipse Connectable Bannerstands - The Eclipse Connectable Bannerstand features top quality LAMBDA Photo color images.It is a portable graphic system that creates a wall using using two, three, four, five, or even six Eclipse units. Let your imagination decide how long of a wall you require. The Eclipse builds seamless, endless displays using exclusive edge magnet technology and snap-lock profiles. A well-balanced, modern, lightweight design. Quickscreen III Bannerstands - An ultra-cool retractable banner system in a new streamlined contour shell! 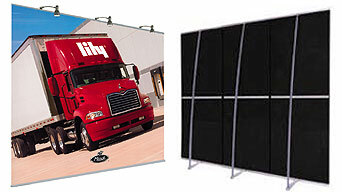 The first retractable banner system on the market designed with interchangeable graphic cassettes.The dynamic new streamlined body and cassette system allows you to change images on site and build a library of reusable graphics.Use the innovative "snap-lock" top profile to fasten or change your images. Experience the smooth-gliding retractable banner system with the additional flexibility of a height-adjustable suspension pole and shoulder strapped carrying case.